LMAO! 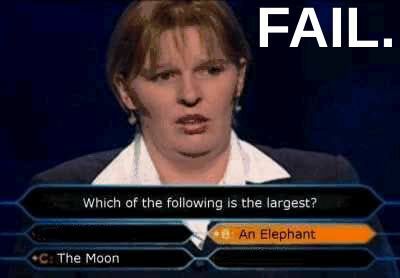 You think that that lady could have at least used some common sense to answer this question instead of using a 50/50 and then still getting it wrong. Hmmm something IN SPACE is smaller than something on Earth, I don't think so. Geeze some people! it wasnt 50/50 you can see the remains of the "a"